When Hurricane Florence hit Eastern North Carolina in the fall of 2018, it was the second time a historic storm hit the region in a short two-year timeframe. Many of the same communities were still recovering from equally devastating Hurricane Matthew in 2016. The NC Disaster Relief Fund was first created by then-Governor Jim Hunt after Hurricane Floyd in 1999 to collect donations that were being offered to support the state’s recover. After last fall’s Hurricane Florence, the fund was reactivated by Governor Roy Cooper to collect donations by individuals and other organizations in North Carolina and beyond. The fund collected more than $5.4 million in donations aimed at providing quick relief to organizations and local governments working to address immediate and short-term needs for communities and families that would otherwise take months or years. Golden LEAF was asked by the Governor to manage the fund’s grant program. The Foundation quickly accepted the role and designated a special committee of board members to oversee this project. To date, grantees of the NC Hurricane Florence Relief Fund report repairing 331 homes, serving more than 2,000 households, and helping more than 7,000 individuals in 24 of the most severely affected counties. Some of the individuals and families most in need have received support from multiple organizations through the NC Hurricane Florence Relief Fund. 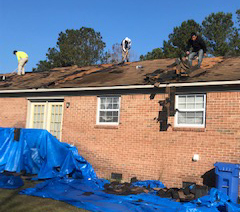 Many homes experienced roof damage during the heavy winds and rains of Hurricane Florence. Genesis 457 is one of the organizations working to get survivors back into their homes through repair work. One of the grants managed by the Foundation went to Genesis 457 Community Development Corporation. When Golden LEAF staff met with Anthony Gibson and Dawn Baldwin Gibson, the founders of the nonprofit, in mid-October, they had not yet been to their own damaged home in Pamlico County. The Gibsons had been staying with family and working to assist others who were affected. Genesis 457 works in underserved areas and groups that are often left out or discouraged by the complex FEMA process. 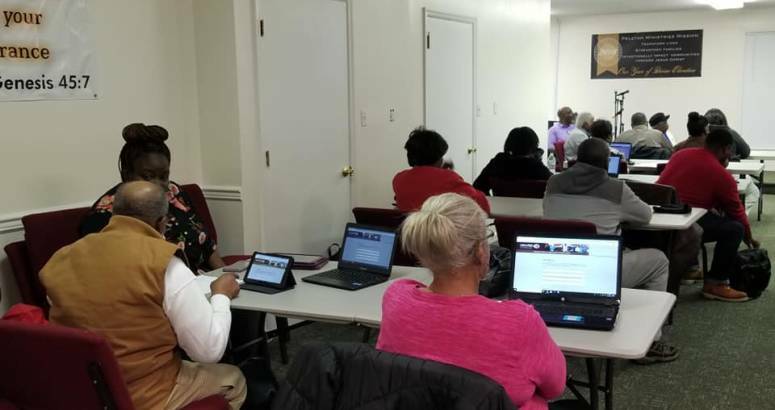 Genesis 457 reaches the community through pop-up and outreach events. They have a network of churches and also work with a county’s FEMA designated long-term recovery group. Genesis 457 works with organizations to access underserved areas and groups with respect and sensitivity. Golden LEAF awarded $300,000 to the 501(c)(3) nonprofit for home repairs, rental assistance, utility assistance, and replacement of personal property. Funding also went to staff a case manager to assist survivors in navigating available assistance – often an overwhelming task itself. 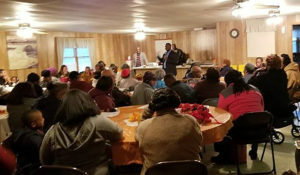 In the few months since the storm, the organization has already helped 128 households – including 62 homes repaired – in Craven, Jones, and Pamlico counties. Another immediate need for relief funding in the region included students affected by Hurricane Florence. Not only were schools flooded but hundreds of the region’s students also spent an extended time out of school. Many had damage to their homes or were dislocated as a result of the storm. One program requesting support was a service to provide students in need with nutritious food over the weekends, called Backpack Blessings. Backpack Blessings is a 501(c)(3) nonprofit formed by local churches to leverage bulk buying and volunteer labor for a weekend food program for students in Craven, Jones, and Pamlico counties. Backpack Blessings works in partnership with the Food Bank and local retailers to assist a greater number of students. Because Hurricane Florence destroyed many of the previously packed backpacks, more students were in need, and some of the funds allocated to the program were needed for emergency food boxes instead. Backpack Blessings requested and received funding from the NC Hurricane Florence Relief Fund to pack an additional 4,000 bags for the 2018-2019 school year. Golden LEAF awarded $12,000 from the Relief Fund to Backpack Blessings to help 142 students living in food-insecure homes in Craven, Jones, and Pamlico counties. This is a small sample of the work being done to help the region get back to their normal lives quickly thanks to the generosity of the contributions to the NC Disaster Relief Fund. And while much has been done to support rebuilding after Hurricane Florence, these communities know first-hand there is still much left to do. The Foundation will continue to work with the state to address immediate and ongoing needs until these communities are made whole once again. Learn more about the organizations funded through the NC Hurricane Florence Relief Fund by clicking here.